~ “செய்ய முடியாத தவத்தை செய்து இப்படி ஒரு செம்மலைப் பெற்றெடுத்த தசரத மன்னனுக்கு என்ன கைம்மாறு செய்யப்போகிறோம்,?” என புகழ்ந்து மகிழ்ந்தனாராம் அயோத்தி மக்கள். Today (25th Mar 2018) is the holy day of Sree Rama Navami – the day on which Lord Sri Ramachandra murthy, the supreme avatar was born in the blessed land of Ayodhya. Lord Rama descended on earth for the purpose of upholding righteousness and rewarding virtue. The Greatest of Ithihasa purana ‘Sri Ramayanam’ is the undiluted history of the Greatest Person who descended on this Universe.. .. .. ~ and there is also the great character – a warrior, mightily powerful, whose body was as hard as a diamond, whose speed equalled those of fastest flying eagles, who possessed great wisdom, who could organize a group of roaming ones, who can jump hundreds of miles, yet who remained at the feet of his Master, totally committed thinking of their welfare alone – unassuming, yet capable of telling the right things at the right moment – that is Pavana Puthra Hanuman – Aanjaneya, who is called ‘siriya thiruvadi’ – bearer of Lord Rama – who carried Rama on his shoulders during the war in which the demon was killed. 'மாணிஆம் படிவம் அன்று, மற்று இவன் வடிவம்; மைந்த! *** அங்கணெடு மதிள்புடைசூழ் அயோத்தியென்னும் அணிநகரத்து உலகு அனைத்தும் விளக்கும் சோதி*; வெங்கதிரோன் குலத்துக்கோர் விளக்காய்த் தோன்றி விண்முழுதும் உயக்கொண்ட வீரன்றன்னை* செங்கணெடுங் கருமுகிலை இராமன் தன்னை…………. ***In the 10th decad, Azwar sees the one at Thillai Nagar Chithirakoodam [modernday Chidambaram] as the mighty warrior born in Ayodhya **… it was Perumal Thirumozhi of Sri Kulasekara Alwar in the goshti. 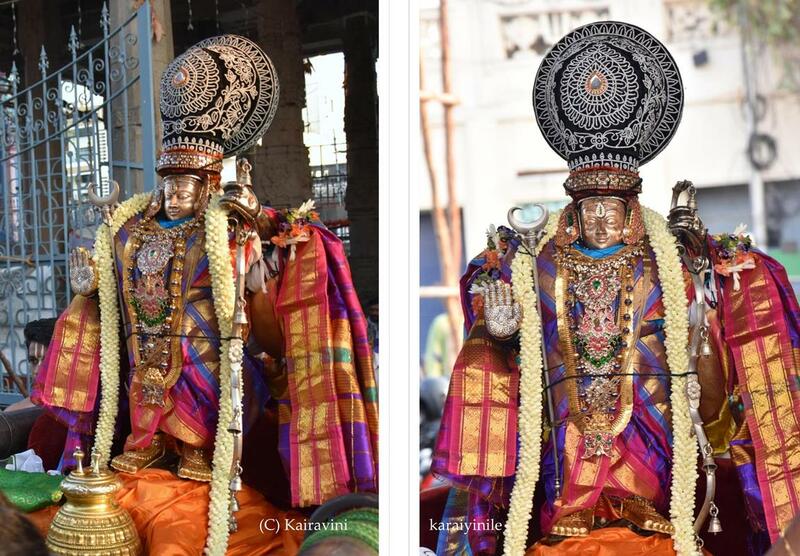 Here are some photos of Lord Sri Rama Hanumantha vahana purappadu.